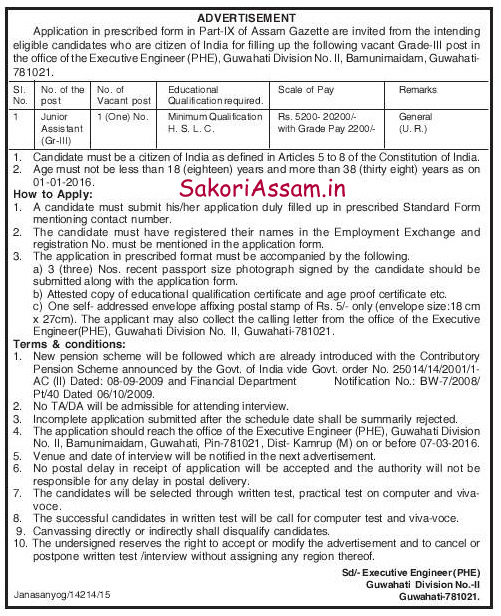 Application in prescribed form in Part-IX of Assam Gazette are invited from the intending eligible candidates who are citizen of India for filling up the following vacant Grade-III post in the office of the Executive Engineer (PHE), Guwahati Division No. II, Bamunimaidam, Guwahati-781021. Educational Qualification: Minimum Qualification H.S.L.C. Age: 18 to 38 years as on 01-01-2016.
i. A candidate must submit his/her application duly filled up in prescribed Standard Form mentioning contact number. ii. The candidate must have registered their names in the Employment Exchange and registration No. must be mentioned in the application form. iii. The application in prescribed format must be accompanied by the following. a. 3 (three) Nos. recent passport size photograph signed by the candidate should be submitted along with the application form. b. Attested copy of educational qualification certificate age proof certificate etc. c. One self addressed envelope affixing postal stamp of Rs. 5/- only (envelope size: 18cm x 27cm). The applicant may also collect the calling letter form the office of the Executive Engineer (PHE), Guwahati Division No. II, Guwahati-781021. The application should reach the office of the Executive Engineer (PHE), Guwahati Division No. II, Bamunimaidam, Guwahati, Pin-781021, Dist- Kamrup (M) on or before 07-03-2016.